Denver Public Schools teachers are planning to strike Monday after negotiations over a compensation package that allowed teachers to earn additional income failed. Negotiations between the Denver Classroom Teachers Association and the Denver Public Schools District for the Professional Compensation System for Teachers, implemented in 1999, have been ongoing for 15 months, according to ABC Denver affiliate KMGH. The ProComp contract, which offered incentives that allowed teachers, school nurses and psychologist to earn more money on top of their base pay, expired on Jan. 18. The teacher's union and school district have been disagreeing on how to improve the current pay scale for how teachers are paid. The two sides negotiated for six hours on Saturday, after which union leaders announced they would go through with the strike as planned, The Denver Post reported. The union is proposing a package of $28.5 million for teacher compensation, while the district was offering $23.3 million as of Saturday night, according to KMGH. Each side is also disagreeing on how teachers can go about increasing their compensation over time. While the union's proposal would allow teachers more opportunities for pay raises as they gain more credits toward advancing their education, the district's plan would place teachers in positions at high-poverty schools that are harder to fill at the top of the list to receive bonuses, the local station reported. "Teachers were stunned when DPS proposed hiking incentives instead of putting that new money into base pay where it could make the entire district more competitive," said Henry Roman, teacher and president of the Denver Classroom Teachers Association. "We are incredibly disappointed that on the last day of bargaining and less than two days before a strike, they doubled down on one-time incentives teachers do not want, and the data shows do not work to keep teachers in their schools." The district released a statement saying it is "disappointed" that union leaders "walked away from the table." 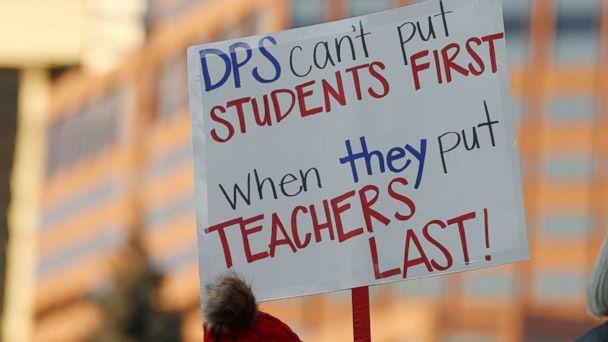 "DPS presented an updated proposal that responds to what we have heard from teachers, aligns to our values of equity and retention, honors the ProComp ballot language, and significantly increases the base pay for all our educators," the statement read. The strike will be the first to occur within the city's school district in 25 years. Denver schools will be open during the strike, but early childhood education classes will be canceled. Teachers participating in the strike can be forced to return to class if a judge determines the strike represents a threat to public health or safety and issues a court order mandating that they do so. 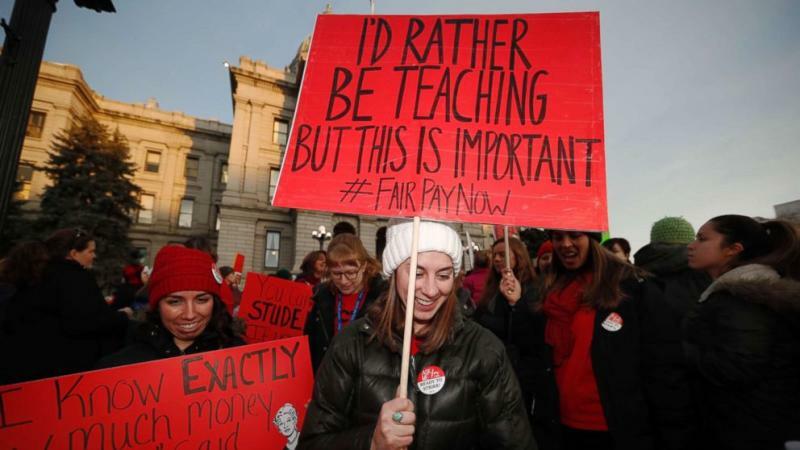 Educators participating in the strike can lose their job if the district proves "neglect of duty" or "insubordination," but the teachers have a right to due process to challenge the school board, according to KMGH. The union wrote on its website that "it is highly unlikely" that the school board would spend the time and expense involved in taking a teacher dismissal case to trial. The district can withhold pay for teachers who strike, according to the union, but it is possible for the teachers and district to negotiate "make-up" days. Teachers who strike are not eligible to receive unemployment benefits, KMGH reported.